After running up record debt-to-income ratios during the bubble economy of the 2000s, young adults shed substantially more debt than older adults did during the Great Recession and its immediate aftermath—mainly by virtue of owning fewer houses and cars. 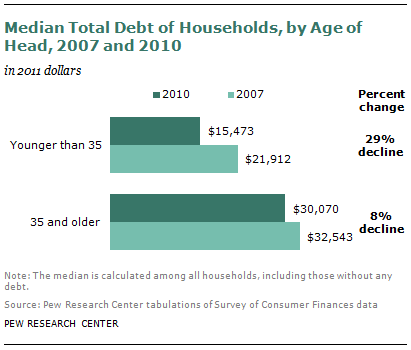 From 2007 to 2010, the median debt of households headed by an adult younger than 35 fell by 29%, compared with a decline of just 8% among households headed by adults ages 35 and older. Also, the share of younger households holding debt of any kind fell to 78%, the lowest level since the government began collecting such data in 1983. Debt reduction among young adults during bad economic times has been driven mainly by the shrinking share who own homes and cars, but it also reflects a significant decline in the share who are carrying credit card debt, from 48% in 2007 to 39% in 2010. On the other side of the ledger, many more young households were carrying student loan debt after the recession than before: 40% had such debt in 2010, up from 34% in 2007 and 26% in 2001.